OCCT comes from "OverClock Checking Tool". Here is a list of its features: Up to 16-core support; Customizable tests; CPU and Motherboard detection; Monitoring support through 3rd party application; Can produce graphs showing temperature and voltages during the test; Multi-language support; and much more. I've used programs like Prime95 for years but until last week had never tried OCCT out. I now feel like I've been missing out, this is an excellent app for stressing various components of your PC. Well worth trying. Full marks. This is a winner, love the graphic displays when it's done. Should be very helpful with my overclock. 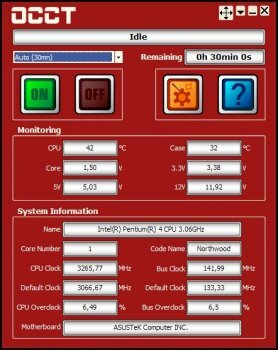 E7400 @ 4.2ghz, 50% overclock stable for a month now. Nice stress tester, and temp and voltage monitor. I like the way it graphs the temperature and voltage, and writes a JPEG for you. 1/2 point off because it doesn't work with all versions of DirectX 9.0x. Also 1/2 point off because of the splash screen with the little hammering red men. They remind me of an old aspirin commercial, and it gives me a headache to watch them. OCCT2.x was an exceptional stress tester and was based on the proved Prime 95 25.x code. This was great, but this new beta uses the Linpack stressing system that was developed by Intel to software stress their CPUs. My system fails the standard Linpack client after just 10 minutes, proving that my "rock solid" OC isn't as solid as i'd thought. Linpack stresses CPUs soooo much more than anything out there i guarantee you'll see temps at least 10 C higher than you've seen in your current configuration.